Last week, I finally made it to a VergeIndy meeting, and not only do I regret not making it to one sooner, but this has made it to the top of my “must attend” events each month. First, the group was much larger than anything I had read indicated. There were easily 200 folks there. For those coming straight from work, there was also Beer and Pizza. How can a professional meeting with beer &pizza lose? Last week, there were three startups giving pitches. The pitches were limited to 5 minutes, and not only did Matt do a great job of holding them to the time, the pitchmakers did a great job staying within their alloted time slot. Each pitch was followed by short Q&A from the audience, with critical questions encouraged to help the start-ups with their thought processes and keep them moving forward. The questions asked were pointed, but not vicious. It was apparent that they were asked either to clarify a point, or cover something the 5 min pitch may not have covered. They have created a unique application for connecting sports officials ( High School and Club Sports levels). 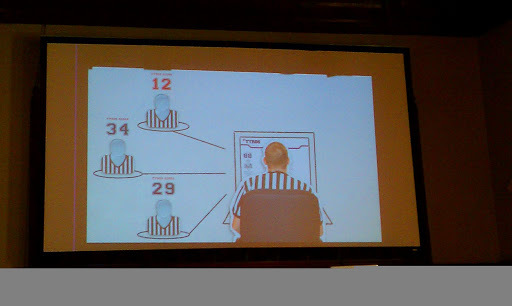 The application is actually a community, where new officials can connect with experienced ones, as well as a scheduling tool that helps officials find open games. The idea behind the application was as much to help grow the future community of sports officials as it was to make it easy for officials to find jobs. Like most community applications, @thetyros gives users ratings, although it was not clear what the factors were that go into the ratings. It was obvious that their founders included people who had been sports officials for years and were passionate about the topic as well as the product. They have a signup for Beta users on their webpage, so if you are a sports official, or are interested in becoming one, give their app a spin. 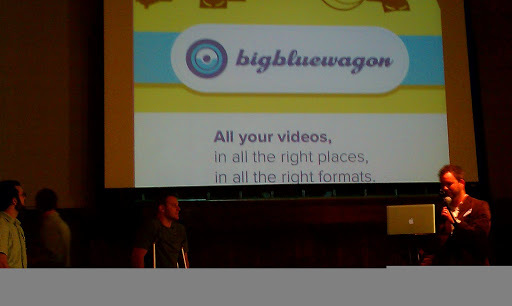 BigBlueWagon is developing a video sharing/embedding application that came from the root needs of their video production clients. They told me an interesting story after the pitches about an experience with a corporate client at a Vegas show who contracted them for 24 hour video turn around, but they did not post or share the video for 2 weeks because that process was difficult. Their tool aims to make it easy for one shot video sharing/embedding for almost anyone. In addition to custom embed codes that allow you to put controlled video free from other site branding or comments on your web page, it also can upload to multiple video sites at once. 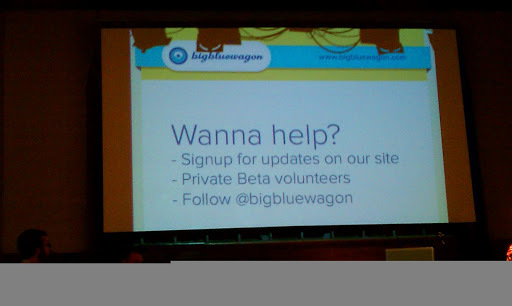 They are in the process of signing up Beta users, so be sure to drop them a line or tweet @bigbluewagon. 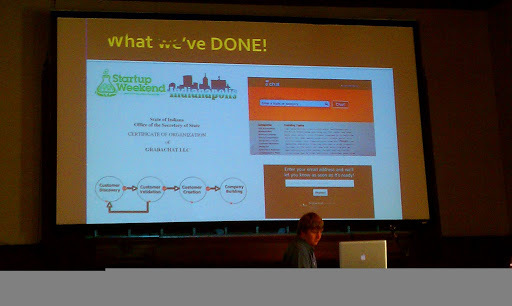 The final pitch of the night was from the winners of the most recent IndyStartup weekend, GrabACh.at. This product is attempting to make a safer version of Chat Roulette by linking to Facebook accounts, and to make it easier to find chats you would enjoy by making your chat interests tags that are searchable. While this product still has some potential control issues, they demonstrated what appeared to be a fully functional base application. The beta testing will be interesting, and they are taking applications now. @grabachat is also doing a good job having product discussions with potential endusers on their twitter stream. Verge was not over after the pitches and the SMS voting for winners. The time/space afterward for networking, meetings and connections was buzzing with energy and activity. This was not a bunch of middleschool geeks lining the walls at the school dance, these were full blown tech startup entrepreneurs at the top of their games. Wanna connect with the In-crowd in Indy? @vergeIndy is where you will find them. Thanks for the write-up, Nan. I love seeing the followup and feedback after each event, and this post was especially insightful. I'm glad you could make it!